Yesterday in Budapest the jury of Magyar Építészek Házában (Hungarian Architectural Association) announced their final selection out of 12 concepts sent in November for MTK Budapest’s new stadium. Their choice is Bord Építész Stúdió, the office which recently opened their first large stadium, Nagyerdei Stadion. 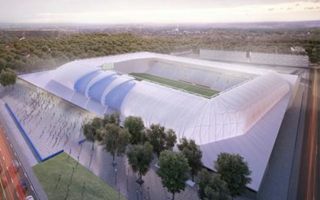 And, very much like in the case of the Debrecen stadium, their plan for MTK sees the stadium enclosed in outer coat of membrane. Only the east side stands out as three recesses in MTK’s club colour blue will be created to provide a more interesting façade. The stands with a single tier will be located on three sides of the field with some room for future expansion left in the south. Initial capacity of 5,000-5,500 complies with MTK’s expectations and ticket demand. Despite the club’s rich history, it’s hardly the most popular side in Budapest currently. The entire stadium will sit atop a large pedestal, which will comprise club offices, commercial outlets and local sports museum, among other facilities. The project should see groundbreaking in spring 2015 and is expected for delivery by June 30, 2016. It’s budget is initially estimated at HUF 6.5 billion (€21m / $26m).